The ultimate hydrating conditioner for all curly hair types, made from the finest natural and organic ingredients for the smoothest hair you will ever experience. An infusion of rich amino and fatty acids with powerful botanicals maximize strength, shine, softness and curl formation resulting in your best curls ever. 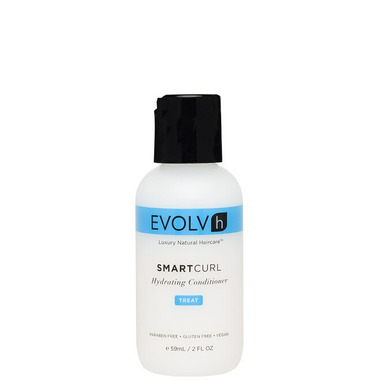 To use: After shampooing with SmartCurl Hydrating Wash, apply conditioner to hair, focusing on mid-lengths and ends, then rinse with warm water. For intensive moisturizing, comb hair after applying and leave in for ﬁve minutes, then rinse with warm water. Ingredients: Water, pHytoBlend (proprietary concentrate blend of 20 herbs in an aqueous base ), Brassicamidopropyl Dimethylamine, Dicapryl Succinate, Brassica Glycerides, Palm Oil, Soya, Safflower Oil, Soy Amino Acids, Vitamin C, Wild Pansy, Sweet Clover, Apricot, Nasturtium, Nectarine, Passion Flower, SmartScent™, Citrus Seed Extract.